A lot of people have been asking me these questions, so here I am writing this post for you lovely lot! Firstly, it all started off when I visited my local STA Travel. I decided to go in, just to browse at a few brochures, really not sure what I wanted to do apart from leave the UK for quite a few months! I thought about Canada and America, but the visas are quite hard to get. 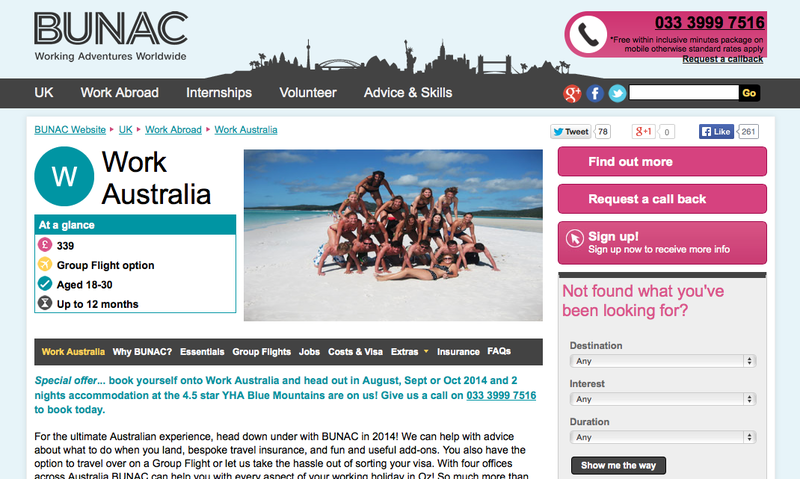 I then looked into ‘Work Australia’ and fell in love with it! STA Travel will get your visa sorted for you, can book your flights (or have a group flight, like I have done with another 40 people) and they can add on lots more things like excursions and skills courses. I only went through STA Travel for my visa, mainly because the member of staff that we had several times was really rude to me and my parents. Even when we would ask for their opinion (as they had done the same trip previously), they didn’t show much enthusiasm and decided to talk bad about BUNAC (who runs Work Australia). I ended up going through BUNAC which was a lot easier! They organised my group flights, accommodation for the first 7 days and are going to handle stuff like setting up bank accounts.. This has taken a lot of stress off my mind, so I would definitely recommend going through this process! When it comes to your visa, don’t feel scared – it is a few small pages of questions to answer and then I received mine within 1 or 2 days! It was as easy as that really, I didn’t have much more to do ‘form wise’, apart from the dreaded paying part! They also do other countries such as the UK (for internationals), USA, New Zealand and Canada. If you have any further questions on this, then feel free to leave me a comment or a tweet! I will post more about my trip just before I go, giving the details on what I will be doing, etc.. Sounds amazing! I’ve been to WA and loved every minute of it. Sorry if it’s already been answered but where are you going In Aus?